Background: Nitrites can exert acute toxic effects in humans. It is widely used as a preservative in dairy and meat products. The nitrites form N-nitrosamines, which are potential carcinogens and cause detrimental health effects. Herein we report a disposable graphite screen-printed sensor developed using silver metal nano particle embedded chitosan composite in the quantification of nitrite at trace level. Methods: Conventional methods possess various limitations. Electrochemical methods provide an ideal platform for trace nitrite analysis. The prepared composite has been characterized by UV-Visible spectrometry, SEM, EDS and XRD techniques. The proposed sensor has been fabricated by using graphite screen-printed electrodes through drop coating of the composite material. The redox behavior and its application of the fabricated electrode have been studied using cyclic and anodic stripping voltammetric methods. Results: Graphite screen-printed electrodes after modification have been used to identify the electrocatalytic behavior of nitrite oxidation in an aqueous medium. All the parameters influencing the analytical signal have been optimized and incorporated in the recommended procedure. The proposed sensor has been used to measure the nitrite levels from commercially available milk powder samples and the results have been compared with the standard protocol. The results of the proposed sensor are in good agreement with the standard protocol. 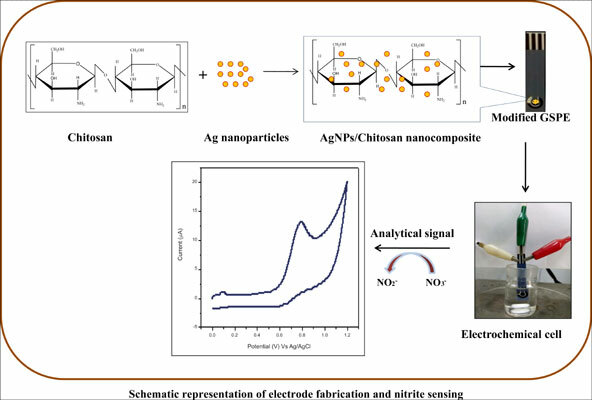 Conclusion: Ag metal nanoparticles have been embedded in chitosan matrix and used as a composite material in the chemical modification of graphite screen-printed electrodes. GSPEs are easy to fabricate. They provide wide linear working range i.e. 30 - 1140 µM of nitrite. The sensor is highly stable, reproducible and provides a very low detection limit of 1.84 µM. The method has been applied to measure trace level nitrite from milk powder samples. Cyclic voltammetry, graphite screen-printed electrodes (GSPEs), milk powder and scanning electron microscopy, nitrite, silver metal nanoparticles doped chitosan (AgNPs/CS), toxic effects.